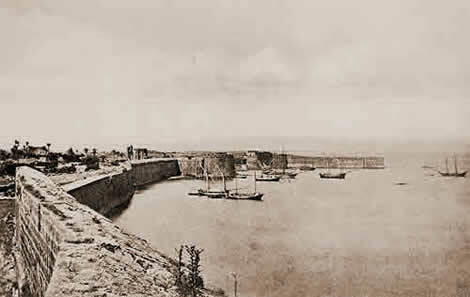 Famagusta Harbour, from the book J. Thompson "Through Cyprus with the camera in the Autumn of 1878"
The city of Famagosta has a pretty fine harbour, protected from every wind. And in this harbour in front of the city gate is a wooden jetty, a stone's throw in length, and vessels come up to this jetty, and there from merchandise is carried to the vessels. In this city live a certain number of Genoese, and a large number of Greeks, because the whole island of Cyprus is peopled by Greeks ; and there is made a great quantity of camlet. There is one custom in force in this city, and throughout the island, that no woman can go out of the city of Famagosta without the leave of the Commandant, and cannot escape giving bail in the Commandant's court for her return to the city : and this is rarely granted to any woman. The reason alleged is that men cannot live in that city but for the women who spin and prepare wool for the camlet, for they have hardly any other means of living. There is another reason too for keeping up the men in the city, which for decency's sake I pass over in silence. But the air of the city is very bad ; at all seasons of the year there is mortality, and men die in great numbers, of the Genoese far more than of the Greeks. While I was there for a month or more the new Commandant who came from Genoa died, and many others were dying, which terrified me greatly, and I remained those days in the city in great fear, chiefly because I was separated from my companions, and had no helper or worldly adviser to keep me sound and restore me to my country. Between that church of S. Nicolas and the palace where now dwells the Commandant, which formerly belonged to the king of Cyprus when he ruled in that city—a fine palace with a large fore-court, many buildings and a fair garden—is a court larger than that of Capua, in which are sold bread, a great quantity of vegetables and other fruits, just as at Capua; and daily there are sold there cloths and many other things at auction. This court is, I think, in the middle of the city. Outside the city of Famagosta there were formerly large and populous villages— I reckon there were two thousand hearths—and in them many fair churches. But now the said villages are wholly destroyed, so that there is not one sound house, and not one person lives there. There are many seemly churches, among which is the church of S. Maria of the cave, very seemly, and many people, Latins, and Greeks, go to the said church to pray.